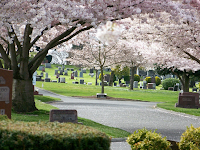 For those not heading for Portland this weekend, but still wish to participate in World Wide SC #28, join us Saturday July 31st for a morning of sketching at Lake View Cemetery (10am. just inside the East entrance located at 15th Ave. E and (near) E. Garfield St.. The #10 Metro bus from downtown travels 15th Ave. Parking can be found at next door Volunteer Park and possibly in the cemetery (I'm waiting for a reply from them). The Volunteer Park Cafe is about 2 or 3 blocks from the entrance, serves breakfast all day and sounds like a good option for lunch. I can't make it. But if you are all going to be around come to the Montlake Arts Festival at the Montlake Community Center. It is just down the hill from Lakeview Cemetary. The Arts Festival is from 10am to 5pm. I have watercolors I am selling and some other stuff. The address is 1618 East Calhoun St. Seattle, WA. 98112. Free Admission and Free parking.